Peter, the non-powered and quite possibly most hilarious member of the X-Force, stole fans' hearts in the latest Deadpool 2 trailer. Now he can also steal fans' retweets, as the humorously useless hero actually has his own verified Twitter account. This marketing strategy has actually been in the works for about a month now, since Peter W.'s first tweet landed on Twitter on March 24. Since then, he has tweeted close to 100 more times. Cleverly, his Twitter rarely mentions or says anything related to Deadpool, instead establishing Peter as his own separate character. Peter's Twitter biography describes Peter as a husband and an experienced apiarist / beekeeper. He also enjoys sports and grilling on his deck. The more you read about Peter from his tweets, the more you discover about who this member of the X-Force really is. The biggest aspect of Peter's Twitter is undoubtedly bee-keeping. He regularly tweets pictures of himself working with the bees. Additionally, he shares a large number of bee-related jokes, adding a bit of fun to his occupation that would give most people the creeps. There also appears to be evidence of an affair between Peter's wife Susan and her fitness trainer Gus, if you read between the lines. A few of Peter's tweets show that Peter and Susan aren't the most happy together, and that beekeeping is the only thing keeping him happy. There are also a number of mentions of Susan going off to "train" with Gus in the garage, while Peter does his own things like taxes and tending to the bees. One of Peter's most recent tweets, making a pun about fish, subtly snuck the hashtag #IThinkSusanIsCheating at the end of it. This strange, fictional Twitter plot may develop between now and the release of Deadpool 2. In fact, there's a very good chance that Susan's supposed affair may become a major motivation for Peter's character when we see him in the Deadpool sequel. Quite possibly the biggest feat accomplished by Peter's Twitter account is the fact that the official "Deadpool Movie" Twitter followed him. Up until now, the only other Twitter account that Deadpool followed since the page's creation in 2014 was Hello Kitty, so this is a pretty big accomplishment. All in all, this is a pretty clever marketing plan by 20th Century Fox. Fox certainly has high expectations for Deadpool 2, considering the wild, record-breaking success of the first Deadpool movie, which quickly became the highest-grossing R-rated movie of all time. FOX is likely hoping that this fake Twitter account will be a good way to market their latest sequel, and it seems to be working, as Peter's Twitter doubled its follower count only a couple of hours after the final Deadpool trailer dropped online. 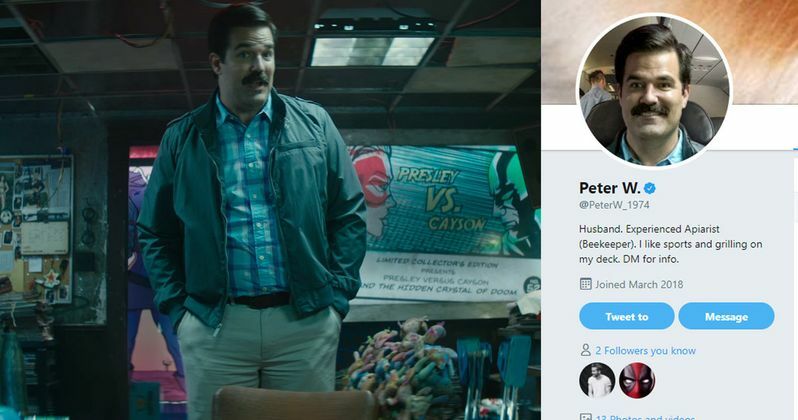 Hopefully this entire Twitter account is just setting up more of Peter's character in Deadpool 2. Peter was certainly one of the best parts of the latest Deadpool 2 trailer released by Fox, and we are optimistic that this amount of character setup will pay off in a big way when the movie hits theaters next month.